With the earlier British counter-attack stalled in the east and unable to push Kampfgruppe Frey back to their start line it was time for the Germans to keep up the pressure on the struggling 15th Scottish Division. Mounting up, Kampfgruppe Weidinger (undefeated in this campaign so far) resumed the attack on the western flank of The Scottish Corridor. Both sides also had their full infantry platoon. All the action for the last few campaign turns has been on the eastern flank of the salient with Kampfgruppe Frey, but now it’s the turn of Kampfgruppe Weidinger to get rolling and try to squeeze the life out of the Jocks. The Germans started well, with a full six free moves of their patrol markers. This allowed them to get JOPs up into the orchard, if they hadn’t achieved this the German infantry would have had a hard time crossing open ground. German force morale was decent at 9 points, but British morale was looking a little low at 8. This was tank country, and both sides knew it. The Germans expected they might be facing Sherman tanks, which meant the prospect of a 17pdr gun, so the Panther was there to bait the British while the Pak 40 waited. On the British side the infantry would need to be well dug in to hold this terrain. With too few support points to get a 17pdr gun the anti-tank defences would have to rely on either a towed 6pdr, a 75mm Sherman or a Churchill. I opted for the latter as it has thick armour and could be used to counter-attack if it knocked out the German armour. The German attack came on in strength, with two panzergrenadier squads deploying into the orchard straight away, but they elected not to press forward onto the British positions just yet, with both squads going on overwatch. The reason became clear soon, as their tank support rumbled into view, a Panther moving along through the fields adjacent to the road (clearly fearful of mines on the road itself). A single British section deployed into the orchard, with the platoon commander personally commanding the outpost. The German tank advanced cautiously, expecting a PIAT bomb to come bouncing out of the orchard at any moment, but for now the British troops in the orchard stayed out of sight. In doing so the Panther would have to come around to the rear of the orchard to get them, and in doing so would have to expose a flank to either the British JOP in the orchard, or the one further back in the hedge. The Panther crew were not falling for it though, and after advancing a short way they declined to swing around behind the orchard. With the German infantry advancing and the tank not turning to show its flank the British commander decided it was time to start the shooting, and from the hedge in front of the Panther a 75mm round blasted out and struck the German tank, slightly rattling the crew. The British defenders had a Churchill tank concealed in the hedge, and spotting its attacker the Panther immediately returned fire, but missed the better-positioned British machine. A flurry of shots from both sides rang out, but despite both tanks scoring hits and inflicting some minor damage, neither tank took any critical damage. The Germans played interrupts twice in the British phase to try and get shots off before the Churchill, but the thick armour proved good enough to stop the high-velocity 75mm rounds from the German gun. A 2″ mortar deployed adjacent to the Churchill and started supporting it. The British tank would fire, hit the Panther and fail to do anything much to it, then the 2″ would drop smoke in front of it. In the German phase, the Panther would advance 1d6 (+2″ for “fast”) which would take it out of the smoke and fire back at the Churchill. It has to be said that German gunnery was patchy. An early hit forced the Churchill to reverse and nearly take it back off the board, but then suffered several misses in a row, before finally scoring a small victory by damaging the Churchill’s gunsight. Meanwhile, in the orchard the British had sent up their PIAT team to try and pour it on the Panther. Hurrying forward with the bulky weapon the officer led the small team to the edge of the orchard where they could see the steel beast, and lobbed a round at it, hitting but inflicting no damage. One of the German squads moved towards the PIAT, and so the British section shuffled over to put themselves next to the PIAT team and give them some cover. This put the two infantry units in range of each other, and while the tank guns boomed away outside the orchard, the clatter of small arms started to rattle the orchard. With the Panther struggling to knock out the camouflaged and well-armoured Churchill, the Germans doubled down and revealed their Pak 40, which was in a commanding position next to the road. Both the AT gun and the Panther pounded the British tank, but some indifferent shooting and solid British steel kept the green machine fighting on. With its main gunsight damaged, the Churchill switched its fire from the Panther and started hurling HE and Besa fire down the road at the AT gun, which presented a softer target than the seemingly indestructible Panther. The PIAT tried to do something useful by lobbing its two remaining shots at the German tank, but everything just bounced off. In the orchard, the British and German infantry traded fire, with casualties on both sides. It looked fairly even for a while, but the Germans scored a hit on the British JL, although the Brits lost no morale from it. This put the corporal on one CI, and shortly after he got hit again, killing him and costing the Brits their first point of morale. One of the German MG teams had lost a couple of men, and the British tried to concentrate fire on it, but weren’t making much impact. The firefight was slipping away from the British, and the PIAT team soon lost a man and took enough shock to cause the other man to break, taking another point of morale with him. The PIAT team fell back towards the main line of resistance near the Churchill, and the remnants of the rifle section were pinned in the orchard and looked like they wanted to leg it, too. With no real chance of getting back into the fight their officer declined to rally any shock, it was time to retreat and the only way to do that was to allow the section to break. And break they soon did, scurrying back towards their tank. Meanwhile that tank had been relentlessly pounding the Pak 40, which was soon reduced to only two crew (one man and the JL) but it kept firing nonetheless. It hit the Churchill several times, forcing it to back up on one occasion and inflicting some shock, but the British tank commander kept his crew in hand and the tank fought on. With their comrades falling back from the orchard and the Germans now advancing with their own officer in charge, the British main line revealed itself. Dug into foxholes by the road in front of the Churchill a fresh British section joined the opened fire at the Germans in the treeline. The Germans returned the compliment, and moved up their second squad. The British officer detached himself from the broken section and moved to command the line of foxholes. And a good thing he did, as the Germans moved up to grab the JOP in the orchard and then ended the turn, kicking another two point of British morale thanks to the loss of the JOP. This slammed British morale all the way down to 3, causing the loss of two command dice. Things were now looking pretty sketchy for the Brits, but the Pak 40 was in bad shape and finally took enough shock on its surviving crew to make them abandon the gun. This was the first blow to German morale, they were still on eight. With three command dice to control two sections and a tank the Brits style would be seriously cramped, but I decided it was still doable for now. Actual casualty numbers on either side were about equal, and if the well-dug in infantry could get some lucky hits on German leaders and if the Churchill managed to knock out the Panther there was still a chance of stopping the Germans. So the British commander played his last card, and revealed his last section dug in on the right flank. The final British section deploys, dug in. The British now had two well dug-in and fairly fresh sections facing two German ones in light cover, so the odds were pretty even. Small arms fire crackled back and forth over the open fields, and the British force was managing to keep up a decent volume of fire despite only having three command dice. 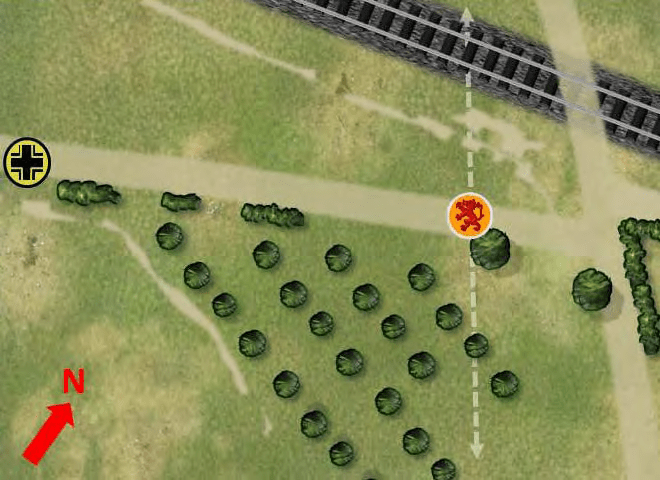 Luck however was not on their side; a Bren team suffered some unlucky casualty rolls and was wiped out, chopping one of their precious morale points and making one of their JOPs evaporate, and shortly after a clean hit on the British senior leader dropped him stone dead. With the loss of their officer British morale crashed to zero and the men abandoned their foxholes and took to their heels. The battered and smoking Churchill grumbled back from the hedge and slipped away, leaving the field to the Germans. 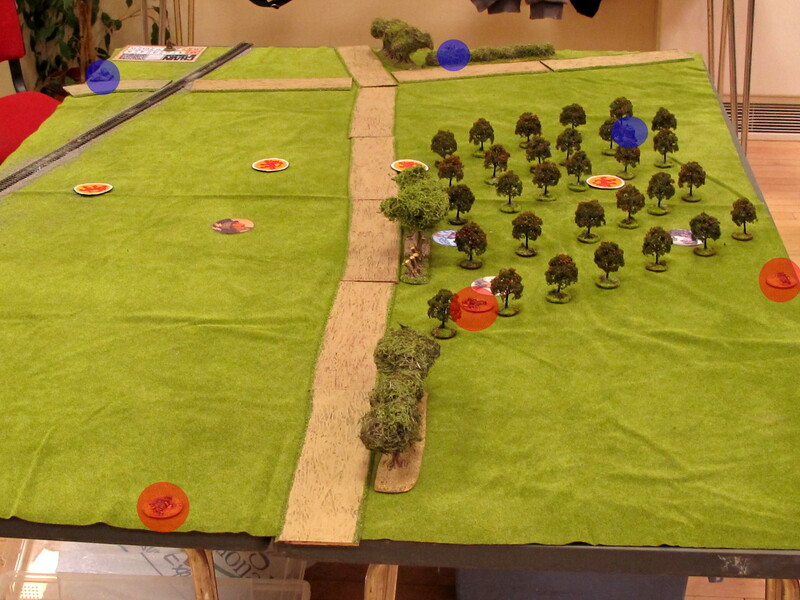 Both sides had spilled a fair bit of blood, with about 8 casualties each during the game. However , the German force ended up with a punishing eight point morale advantage, which would wipe out all of their losses. On the British side permanent losses were 5 dead, 3 wounded. Two of the dead were the lieutenant and a corporal. On top of this, by the time the British retreated one whole section was cut off from their JOP, resulting in two men POW and another three MIA. All up, a terrible result for the British and a major win for the Germans. With ten men lost in the engagement including an NCO the men’s opinion among the Jocks dropped 4 points to -9, earning a carpet parade for the platoon leader. This is now starting to get critical, hugely impacting on British force morale rolls and reducing the effectiveness of the platoon leader. The CO’s opinion also drops another point to -4 meaning -1 support point per game. Much happier news on the German side. The CO continues to be happy, bumping up a point to +7, meaning the already well-supported Germans will be enjoying a +3 support point swing vs the British from what the scenarios say. The very light casualties recovered one point from the mens’ opinion, bring them back high enough to drop their force morale roll penalty from -2 to -1. So the Germans actually came out of this game stronger than they went in, while the British are starting to look like a bit of a spent force. It was an enjoyable game to play, but in terms of the British prospects for the campaign it was a disaster. The next game in the campaign should be an attack by Kampfgruppe Frey at the other end of the ladder, but it doesn’t look winnable for the Brits as they’d be sending a weak platoon with only one support point and low morale against a stronger German platoon with 16 support points. So I’m going to give ground there, it’s not even worth bothering to play the game, nothing good will come of it for the Brits. That leaves one final table for the Germans to capture, and only two campaign turns left to do it. In practical terms that means that if they win that game they’ve won the campaign, and if the Brits win then they salvaged a draw as they’d be able to waste the final campaign turn with a counter-attack on the Germans, the outcome of which wouldn’t change the result. Putting a section into the orchard was a mistake, and cost me the game. They were always going to be outgunned, and had not real line of retreat to pull out before things got too hot. While I hadn’t planned for them to be my main line of resistance you generally can’t get away with using a section as a speed bump in CoC. By the time they had broken my force morale was so low I couldn’t effectively command my main troops. I should have just let the Germans have the orchard and held them further back with my dug in troops. Interesting game. Gratters for pushing on with the campaign. Great AAR Andy, we are only weeks away from starting our first campaign games. The forward defence was OK, especially if you had used the entrenchments for it. I think your real mistake was not to bail when you dropped down to 3 dice. That would have preserved some of your men and meant that the Germans could recover less men due to the difference in morale.